Is it time to quit your day job so you can become a professional NHL eSport player!?!? Well, not quite, but this is a huge step in the right direction as far as NHL eSports goes! Having the official NHL involved and excited about eSports is something I didn’t expect to see for NHL 18 or even 19 for that matter. I know a lot of EASHL fans are disappointed that the tournament is being run as 1v1 in the Online Versus mode, but you have to understand that this is just the beginning and organizing a huge 1v1 tournament is waaaay easier less difficult than full on 6v6 EASHL. With that said, I hope this does lead to EASHL being the eventual eSport mode because having so many AI controlled players out there in such a fast paced game and competitive tournament for $100k makes me cringe a little bit. The tournament is organized by the NHL and being hosted on the FACEIT platform. You can head over to FACEIT now and register for the qualifiers, no buy-in or anything, completely free to enter! Don’t want to compete in it? Then just spread the word to anyone you think might. If you want to see NHL eSports grow then whether you hate 1v1 or not you 100% need to be supporting this tournament. The community has to show the real NHL that they should keep investing time and money into eSports. The tournament officially begins on March 24th, which is when the first Xbox qualifier is. As mentioned above, you can register now for the qualifier here at FACEIT.com(there are still spots available). Even if you miss the first qualifier there are two qualifiers each for both Xbox and PS4 over the next four weekends, see the schedule below. In order to participate in the Online Qualifiers you must fit the following requirements at the beginning and throughout the tournament. *Even if you are a legal resident of Canada, but currently located in the USA you can still participate but you must participate in the USA qualifiers. The important part is being a legal resident of any of the 3 regions and also being located inside any of the 3 regions – doesn’t matter the combination as long as both those conditions are met. If you are a legal resident of say Australia, but currently located in the USA, you are NOT eligible. **You can play in ALL the qualifiers as long as you haven’t already qualified. Once you have qualified for the regionals, then you are no longer eligible to enter another qualifier since it would be meaningless for you anyway. The tournament sponsor will cover airfare, travel, and two nights stay in a hotel for each player that qualifies for the regionals. The live World Finals will be played June 19th, 2018 in Las Vegas, Nevada – and in connection with the NHL Awards. Similar to the Regionals, your travel and hotel costs are covered. As mentioned above, the qualifiers are split into three separate regions Europe, Canada, and the USA. If a Player is not a resident of and located in an eligible region, he/she may not participate. All Online Qualifier matches will be played in a Single Elimination bracket on the FACEIT platform as Best of One matches, except the final round of each Online Qualifier which will be a Best of Three series. Keep in mind, that the only benefit of actually winning the Online Qualifier as opposed to being the runner-up is that the winner earns the top seed for the Live Regionals and gets to play a runner-up in the first round of the Live Regionals. Each regional will feature the 8 players, 4 winners and 4 runner-ups, from the respective qualifier as explained above. With the losers of each Regional match playing each other as well. If you lose in the losers bracket, then you’re out! The winner and runner-up of each Regional will advance to the World Finals; however, the Regional winner will not only advance but pocket a cool $5,000 for their efforts. Regionals will be played on PS4 only. Xbox players may bring their own controllers, and an Xbox-PS4 adapter will be provided at the venue. Players are not required to bring their own PS4 controllers, but you may choose to bring your own if you prefer… and I highly recommend that you bring your own! You never know how “used” the venue provided controllers might be. The World Finals will consist of the 6 qualifying players from the Regionals, 3 winners and 3 runner-ups, and will begin with all players in one Round Robin group. Each player will play each of the other 5 players once, and the resulting top 2 players will advance to the Best of Three final round for the NHL Gaming World Championship! I’ll post the Online Qualifier tournament brackets here as they go live on FACEIT. They aren’t available until each one officially starts. First and foremost, make sure you check-in on time! You can check-in for the tournament 48 hours prior to the tournament starting. That means if you are registered for the first Online Qualifier starting tomorrow then make sure you check-in now! You can do so by going to FACEIT, clicking on the tournament in your registered tournaments list and then clicking the “Check In” button that will be where my arrow is pointing in the above screenshot. If you fail to check-in within 30 minutes prior to the tournament starting then you will be automatically removed from the Online Qualifier. You can still re-register within that 30 minutes providing that space is available, but I wouldn’t suggest risking it. Okay, now if you’ve never played in a third party hosted tournament like this on NHL 18 or any version of NHL for that matter, you may not be familiar with how to setup the matches. If that is you, then listen up! You don’t want to get disqualified before you even get into a game. Any settings not listed above should be left as the default. If you’re wondering why Music and Announcers should be turned off, I’m assuming it’s related to legalities around promoting streams or perhaps they plan to broadcast their own audio over top of some streams. *The music and announcer setting can be done in the main Online Versus Settings before going into the match. Go to the Display and Audio settings then turn the commentary and menu music all the way down to 0. Not sure if they want Arena announcer and music turned off too, but I did anyway. If you get the settings wrong and a tournament official deems that the incorrect settings affected the outcome of the game, then the host player may have to forfeit the match! So again, very important you get this part right if you are the host. Here is a quick video of what inviting your opponent to a game and doing the settings will look like on Xbox. In this case lets pretend I’m the host and my first round matchup is against TetchedLake2. Once the Online Qualifier tournament goes live, the bracket for each of the Online Qualifiers will be automatically populated with random seeds. Players will be notified of their match via an onscreen popup on FACEIT.com. Once you click “Go To Match” on the popup, you will be taken to the “Match Room” that I mentioned above. The Match Room should give instructions on how to setup the match; however, FACEIT has a couple of short guides that include screenshots you can check out now, so you’re a bit more prepared. It is mandatory for each player to capture a screenshot of the result after each match. If you don’t then it may result in forfeiting the match. Of course, this is much more important for the winner rather than the loser of a match. Once either player has submitted the match results then the opposing player has 10 minutes to confirm or dispute that result. Failure to respond to a submitted result within 10 minutes will automatically confirm the original submission as the official match result. I haven’t had many issues in past competitions like this; however, this is a big tournament and it’s likely a lot of newer players will be participating. To be on the super safe side I’d suggest streaming your game on Twitch or any streaming platform that allows you to save the full broadcast. That way you have 100% indisputable proof in-case anyone tries to pull some sketchy stuff on ya. This especially applies to any in-game violations that would be very difficult to prove otherwise. We’ll get to the in-game violations and rules now. The following actions are strictly prohibited during a game and can result in suspension of the offending players account and disqualification. I’ve taken these directly from the Official NHL GWC Rules(section 7). Shows dissent by word or action towards other Players or the Tournament Entities. Again, the above is taken directly from the official GWC rules and they also state that “appropriate evidence” must be provided which further backs my recommendation that you should record and/or stream the entire game! I don’t know what they consider as “appropriate evidence”, but surely a full recording of the match would suffice if it’s an in-game violation. There will be prizes at both the Regionals and the World Finals. Nothing for the online qualifiers besides the fact you can advance further in the tournament. Each of the THREE Live Regional Final Winners will earn $5,000. Nothing for 2nd place at the regionals, except that they also advance to the World Finals where they are guaranteed at least $2,500. I’ll be streaming all my games on the ChelTips Twitch Channel. *I likely won’t be doing much talking or any at all, I’ll be focusing on not getting first rounded… Follow the twitch channel for notifications of when I go live or follow me on Twitter. If you want a more entertaining stream then I’d highly recommend NugeTV, Nasher61, and HowToChel – all three are long-time NHL streamers. Nasher61 has teamed up with the NHL as the official Community Ambassador for the 2018 GWC so you may want to follow Nasher on Twitter as well for all the tournament updates. I think the official NHL Twitch Channel might be doing something too – maybe not for the Online Qualifiers but surely later on in the tournament so follow them too. 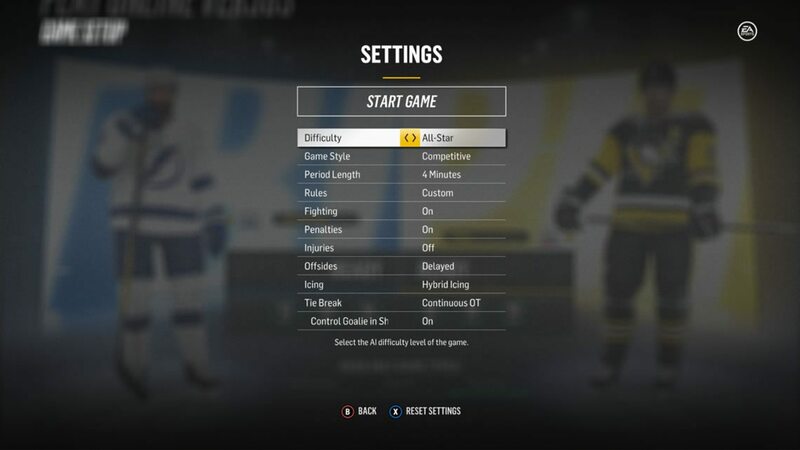 While you’re waiting for those tips posts I’d STRONGLY recommend you have a look at my NHL Coaching Strategies Guide – it outlines what each of the in-game strategy settings do and how they affect your AI controlled players. When it comes to 1v1 gameplay like Online Versus it is absolutely CRITICAL to learn how your AI controlled players will react. If you don’t know where your AI players will be then you won’t last long in the tournament. Good luck to everyone in the tournament and BIG shoutout to the NHL for making this happen! I’m very excited to see what is ahead for NHL eSports. I am not part of the GWC tournament organizing team or affiliated with FACEIT or the NHL in any way. Simply a fan and competitor sharing information. If you run into any issues or have further questions/concerns with the GWC tournament then you can direct them towards FACEIT. Your questions or concerns may already be answered in FACEIT’s 2018 NHL GWC FAQ. I’ll link again to the official NHL GWC Rules too in-case there is anything you would like check or verify. I assume the terms and conditions are subject to change. 8 NHL 19 Tips All Players Need to Know!